Many associate the Post-Impressionism period of art with the works of Vincent Van Gogh. Artists who view The Starry Night often wish they could learn to paint something simular. Now they can! 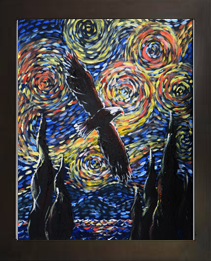 In this project Sharon will teach students how to paint this magnificent eagle in the style of Van Gogh. This project is made with Acrylic paints and is a Level 2 in difficulty.